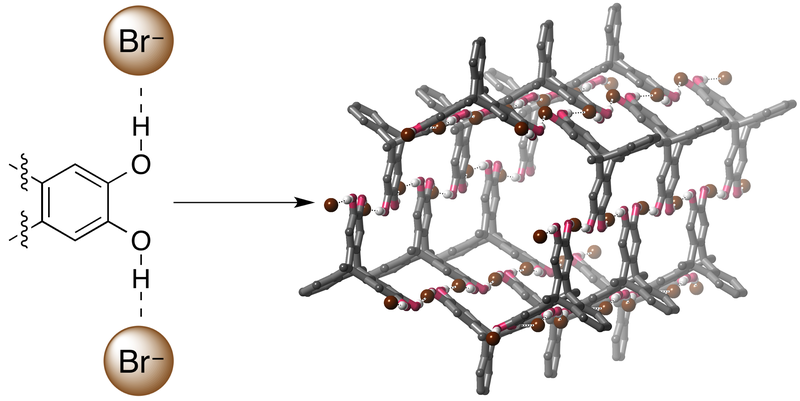 The first “big” paper from the group demonstrates that anions can be used to form 3D supramolecular framework materials. Surprisingly, these frameworks can be formed in water (despite the fact that host…anion interactions are typically weak in this solvent). The frameworks can be dis-assembled and re-assembled in response to acid, and neutralisation, respectively. Furthermore, two forms of the framework can be accessed, and we are able to switch between the two in response to various stimuli. This work used a variety of techniques (NMR spectroscopy, molecular dynamics simulations, X-ray crystallography) to try and understand the processes that govern self-assembly. Using simple model systems we investigated the effect of solvent and tecton geometry on these processes. This paper was chosen to be a “Very Important Paper” by the referees and highlighted on the Chemistry Views website. This work demonstrated that relatively weak hydrogen bonds between alcohol donors and bromide anions could be used to assemble three-dimensional nanotube structures. These nanotubes show surprising stability and can withstand prolonged exposure to heat, water or vacuum. The use of anions to template interesting and complex materials is a key feature of our work in the group.